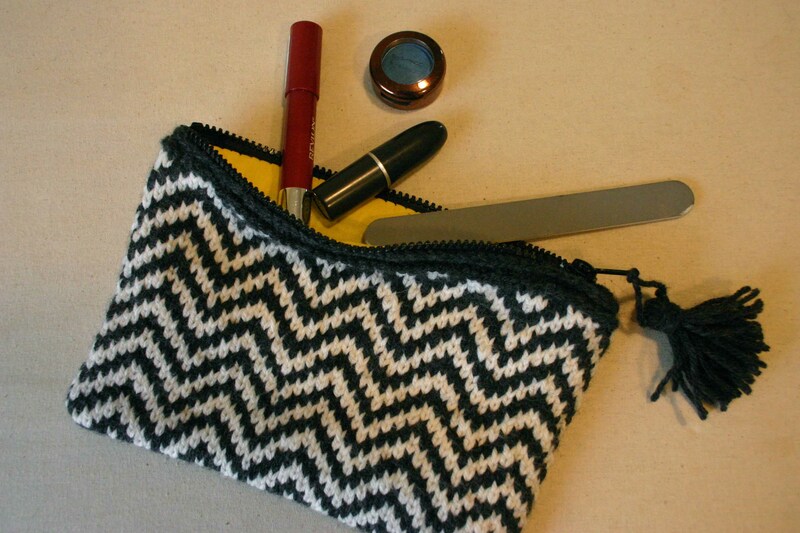 A perfect accessory for Spring, the Zip-N-Zag Bag is a zippery, zig-zaggy, tassely pouch perfect for stashing your makeup or a small knitting project on the go. 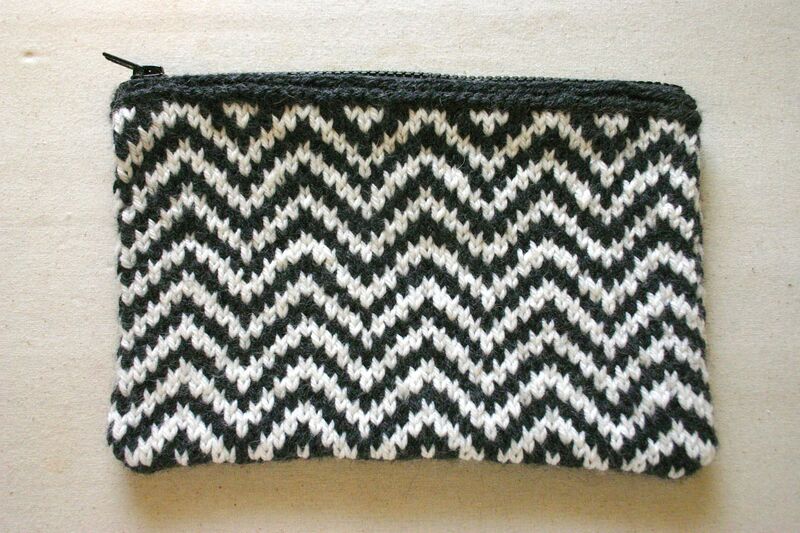 I’m looking for a couple of people to test knit an upcoming design I’ve been working on, the Zip-n-Zag Bag. 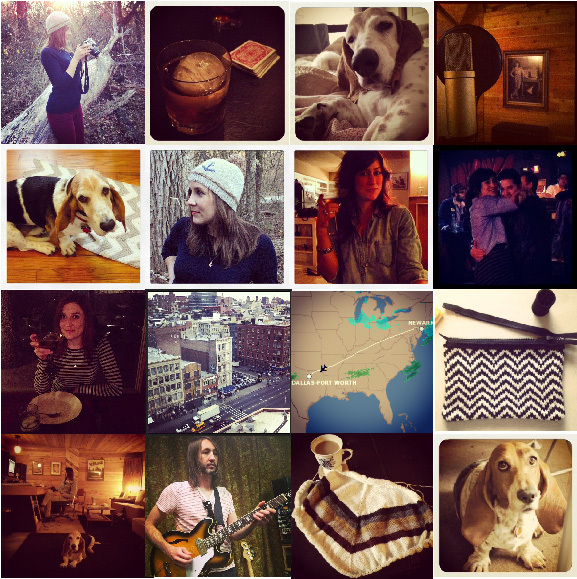 I’m looking for two testers that can complete the item and provide feedback to me by 3/15/13. Skills required are: knitting stranded color work in the round (only two colors are used), provisional cast on, knitting, purling, basic bind off, three needle bind off, sewing in a zipper and fabric lining by hand, making a tassel. Experience: Experience using stranded color work is preferred, but not required. 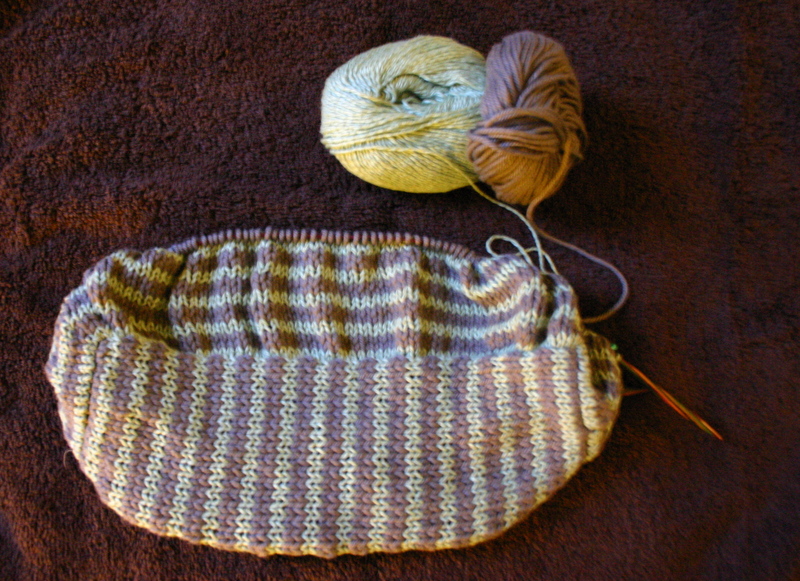 Gauge: 22 stitches and 25 rounds = 4”/10cm in stranded colorwork pattern, worked in the round. 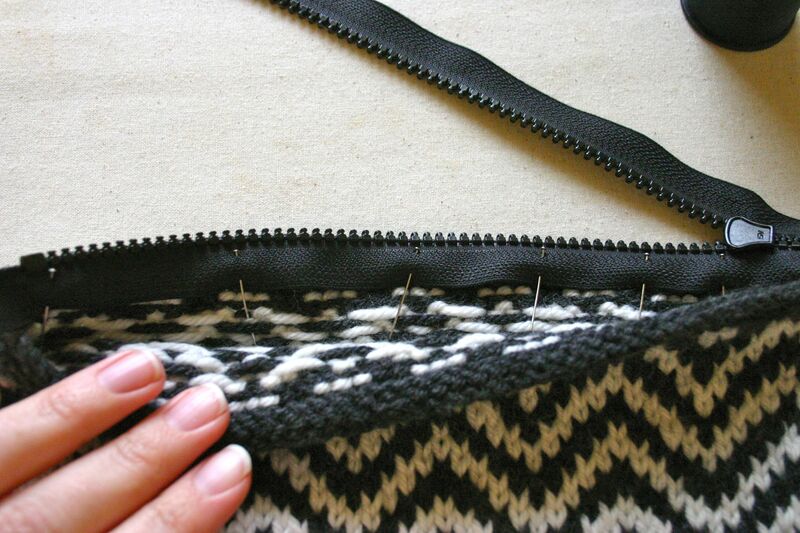 Gauge is important to this project to ensure that your zipper will fit into the finished pouch. Yarn requirements: 300 yards/275 meters of worsted weight yarn in two contrasting colors (150 yards/137 meters of each color). Sample was knit using 2 skeins of Berroco Vintage Worsted in Cast Iron (#5145) and Butter Cream (#5102). Other brands and colors of yarn can be used, but I would prefer you stick to a worsted weight. Notions: Tapestry needle, stitch marker, sewing needle and thread for zipper and lining, pins. 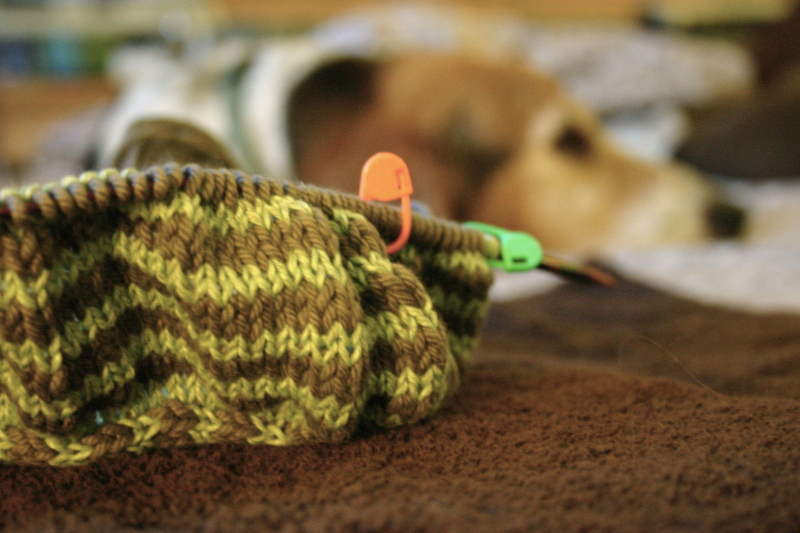 Any questions you encounter as you are knitting, please feel free to email to me. I would like feedback at the end of the project regarding your gauge, what size needles you used to obtain gauge, finished size, and your thoughts on sewing in the zipper and lining. A copy of the final tech-edited pattern will be provided as compensation. If you’d like to test knit this, please leave a comment below letting me know and I will be in touch via email! Well today, I armed myself with needle and thread and just dived right in. 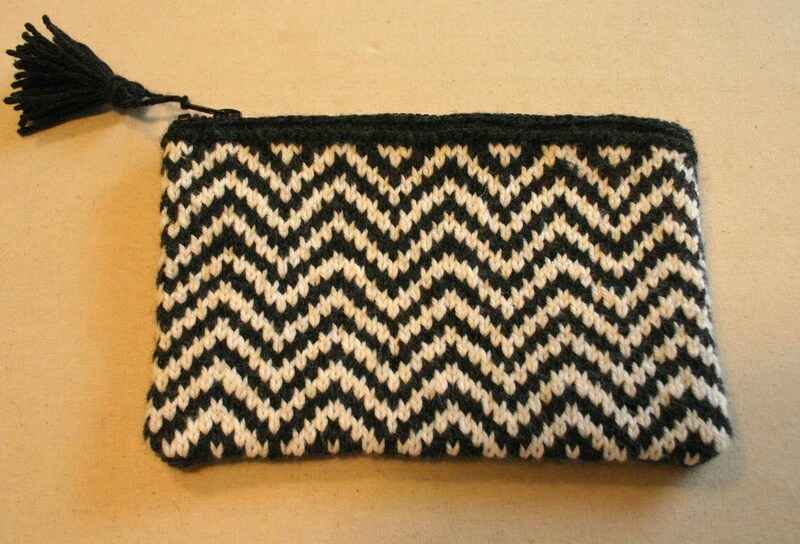 I unzipped the zipper and pinned one side of the tape to the inside edge of the bag and just stitched away. Then I pinned the other side and stitched that down too. And lo and behold, I sewed in that entire zipper in with no major catastrophes. Ah summer… the time of year when we relax a little bit and have some fun. I’ve definitely felt the need for some fun lately so I decided to try a few new things this summer to break myself out of a rut. One recent Saturday morning, I woke up with visions of knitting under a big umbrella on a beach while salty waves washed ashore. An appropriately beachy yarn in a light seafoam color was just beckoning to be made into a hard-wearing beach bag. 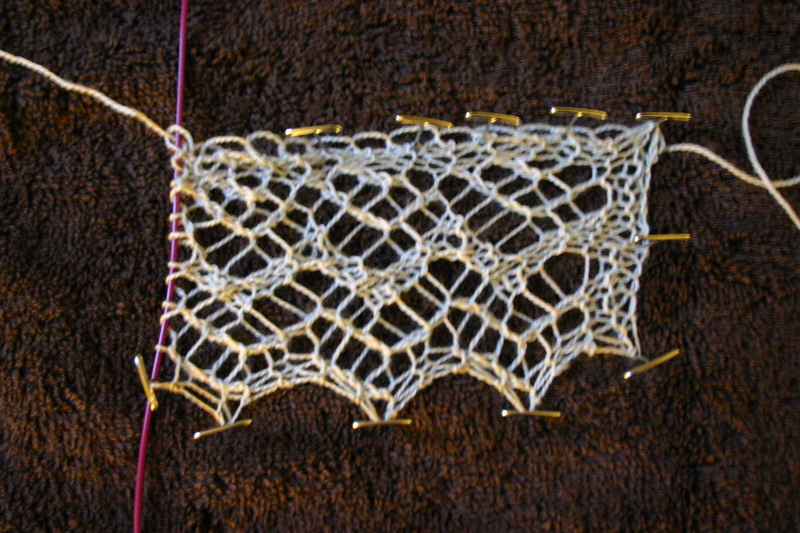 A few hours of Ravelry-perusing later, I decided on the Medano Beach pattern. I coupled in some Debbie Bliss cotton DK in cool grey to give it those fun stripes that are just so popular right now. Following this inspirational wave to try new things, I wanted something that would be a bit of a challenge and keep me entertained. I also discovered that I’m really enjoying working with the thin Hempathy yarn, so I started thinking of light, airy shawls in laceweight yarn, which is something I’ve never worked with before. I fell in love with Brooklyn Tweed’s Rock Island Shawl, which is spectacularly lovely and word on the Ravelry forums is that it’s not exactly beginner’s lace. I picked up some lovely Anzula laceweight in the Seascape colorway and cast on for this just the other night. I haven’t gotten very far, but I think its going to be great.